The total extinction of the Fusulinoidea near the Triassic/Jurassic boundary was the most remarkable extinction in the marine realm. They had survived a much greater extinction at the end of the Permian, however, the event at the end of the Triassic wiped them out completely. During the Jurassic, only the (calcareous) agglutinated textulariines exhibited complicated forms and underwent significant evolutionary developments, which lent to the distinctive and biostratigraphically significant carbonate facies currently recognizable throughout the Tethys region. Symbiotic algae (dasyclad) became abundant in reef environments during the Jurassic and these algae were housed in alveoles within foraminifera. Four biozones were developed by BouDagher-Fadel and Bosence (2007) to divide the Tettangian through Pliensbachian. These biozones are correlated with strontium isotope dates. 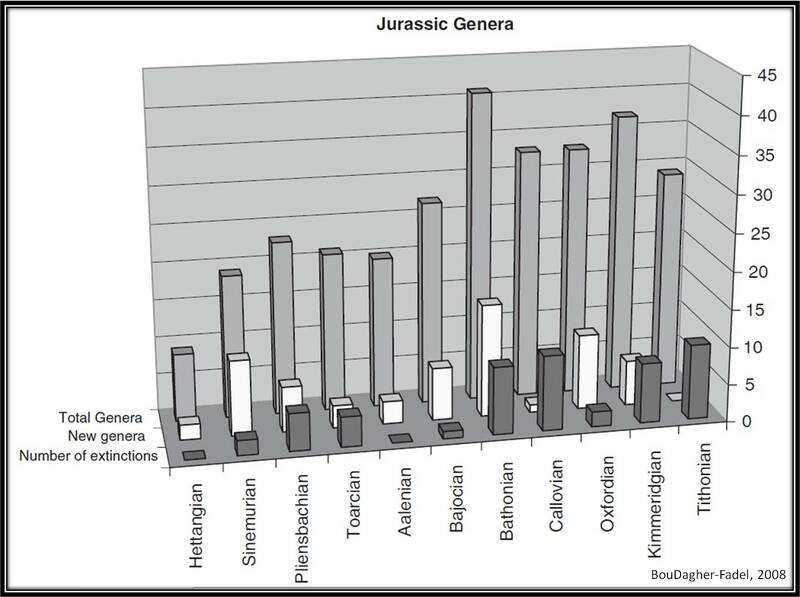 Phylogenetic evolutions have been traced for different groups from different regions throughout the Jurassic. The most important superfamilies of the Jurassic are the Pfenderinoidea, the Lituoloidea, the Textulariodea and Involutinoidea, which are shown on the figure below. Please refer to BouDagher-Fadel (2008) to see detailed discussions on the evolutionary lineages and revised phylogenetic evolutions of these individual superfamiles. Significant parts of the continents were covered by warm shallow waters of the Tethys and Proto-Atlantic during the warm Jurassic period. Tropical greenhouse conditions were predominant worldwide and oxygen levels recovered gradually from the oxygen-depleted conditions of the Triassic period. One of the most significant sedimentary sequences seen in the Mediterranean are the Jurassic carbonates adn these records serve not only as evidence of environmental conditions during this time but also as key hydrocarbon reservoirs (BouDagher-Fadel, 2008). Coral reefs and large benthic foraminifera are the main constituents of these important deposits. During the early Jurassic (Hettangian) the Tethys region was still a stressed environment evidenced by small microgranular and porcelaneous small formainifera with no larger forms present. Later, towards the early Sinemurian, larger benthic forms made an appearance in the form of primitive textulariines typical of inner carbonate platform environments (i.e., rifted western margins of the Tethys) but it was not until the Late Sinemurian that larger, more complicated forms arose (i.e., Orbitopsella), indicating a more stable ecosystem. A brief period of global worming, marked by a transgression in the Early Toarcian, contributed to the deposition of the organic carbon-rich Early Toarcian shales and led to unfavorable environmental conditions for formainifera resulting in possible local extinctions. A shallow carbonate environment was re-established during the Aaleninan and the Bathonian saw a re-emergence of diverse complicated forms. Colder conditions during the Callovian-Oxfordian probably contributed to the extinction of some forms, however, shallow water forms with large intramural alveoles thrived into the Tithonian. These forms are associated with stromatoporoids and green algae and their distributio nextended out into neritic waters under reduced illumination. Many researchers have documented the possible significance of the alveoloes (Banner and Whittaker, 199; Hughes, 2004; Preece et al., 2000). These short-lived forms with narrow alveoles were wiped out by the end of the Kimmeridgian crisis and only robust shallow-clear water forms survived into the Cretaceous. Fragments of the supercontinent Pangea continued to drift in different directions producing large rift valleys during the Jurassic. Warm temperatures were dominant even into high latitudes. While there is no evidence of catastrophic events that led to mass extinction during the Jurassic, four major events occurred; the opening of the North Atlantic via rifting, the termination of the Early Cimmerian orogeny, the destruction of the Tethyan carbonate platform and the pre-Cretaceous Late Cimmerian uplifts and climate changes. Many forms of benthic foraminifera thrived and expanded and the emergence of planktonic foraminifera occurred in the Middle Jurassic. From the Late Pliensbachian to the Early Toarcian, a series of extinctions took place. One of the drivers for ecological stress may have been the Karoo-Ferrar flood basalt event (Palfy and Smith, 2000). The flood basalt province extends for 4000 square kilometers and much of the lava extruded around 183 Ma. 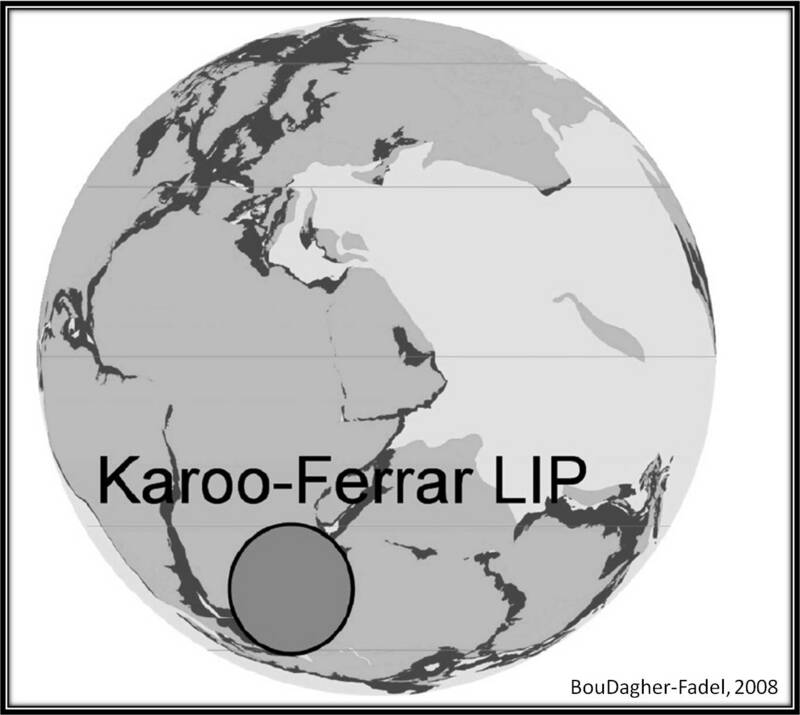 Because the Karoo-Ferrar large ingneous province eruption occurred at higher paleolatitudes than the preceeding CAMP volcanic event during the Triassic, it did not have the potential to affect climate and cause global catastrophe to such the degree that the CAMP volcanism did. induced by the CAMP volcanism at the end of the Triassic. The most significant foraminiferal turnover occurred at the Bajocian-Bathonian boundary and new genera, approximately 30%, appeared as agglutinated forms with multiple alveoles in the carbonate platforms and reefs of the Tethyan margins. The appearance of planktonic foraminifera occurred during the Bajocian and these forms were geographically restricted and represented by Conoglobigerina. They were benthic in the early stages of life and became planktonic in the final stages of life (meroplanktonic mode). Globuligerina were the first planktonic forams that became cosmopolitan and fully planktonic. Noting from the figure above, the end of the Bathonian and Calllovian were associated with enhanced extinction rates. During teh Bathonian, new genera forms reached an all time high and this may have led to a competive evolutionary environment (i.e., more extinctions). Additionally, two major impact events (Puchezh-Katunki crater and Obolon crater) are associated with this time which may have contributed to enhanced rates of extinction. The Late Jurassic brought about changes in the global carbon cycle (Louis-Schmid et al, 2007) due to the widening of the Tethys-Atlantic-Pacific seaway. The final stages of the Jurassic exhibited increased speciation in larger benthic forams, however extinction rates increased at the end of the Kimmeridgian and Tithonian, possibly due to the final opening of the proto-North Atlantic Ocean which brought about changes in paleoceanic circulation (BouDagher-Fadel, 2008). A minor extinction wiped out some of the forms which had colonized deeper waters at the end of the Kimeridgian and about 30% of all forams became extinct towards the end of the Tithonian. Even long ranging well established Jurassic forams became extinct at the End Jurassic, possibly due to a series of large terrestrial impact events or a major sub-marine flood basalt (Shatsky Rise), or both. Agglutinated forams, however, crossed the Jurassic-Cretaceous boundary and flourished before going extinct themselves in the Early Cretaceous.